Two-shelf bookcase features fully adjustable shelves for flexible storage solutions. Shelves adjust in 1" increments, and each offers a 200 lb. capacity. The bottom shelf is fixed. Welded steel construction offers a powder-coat finish for durability. 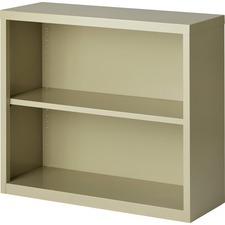 Bookcase meets or exceeds ANSI/BIFMA shelf standards.